TENS OF THOUSANDS of people are expected to take part in running events in both Cork and Dublin today. In Cork, The City Marathon kicked off at 9am with a large crowd set to tackle the over 26 mile course this morning. Meanwhile, the 10k Flora Women’s Mini Marathon will start at 2pm this afternoon from Fitzwilliam Street Upper in Dublin. Traffic is reportedly slow in Cork eastbound on the N40/South Ring Rd from Mahon through to the JLT and restrictions will also be in place in Dublin when the mini-marathon kicks off. Are you taking part in either of these events? Send us your pictures to tips@thejournal.ie. And best of luck. Email “Tens of thousands take to the streets for marathons in Cork and Dublin”. 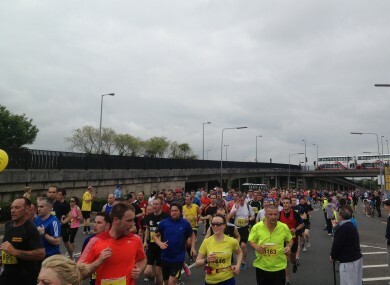 Feedback on “Tens of thousands take to the streets for marathons in Cork and Dublin”.